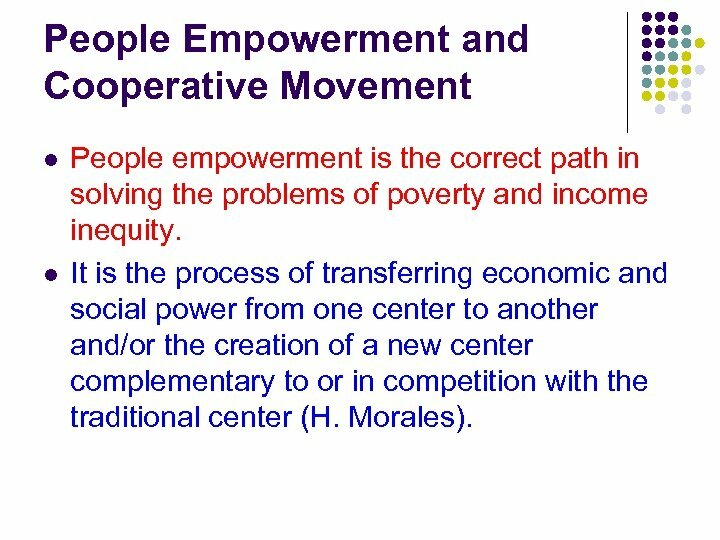 People Empowerment and Cooperative Movement l l People empowerment is the correct path in solving the problems of poverty and income inequity. It is the process of transferring economic and social power from one center to another and/or the creation of a new center complementary to or in competition with the traditional center (H. Morales). 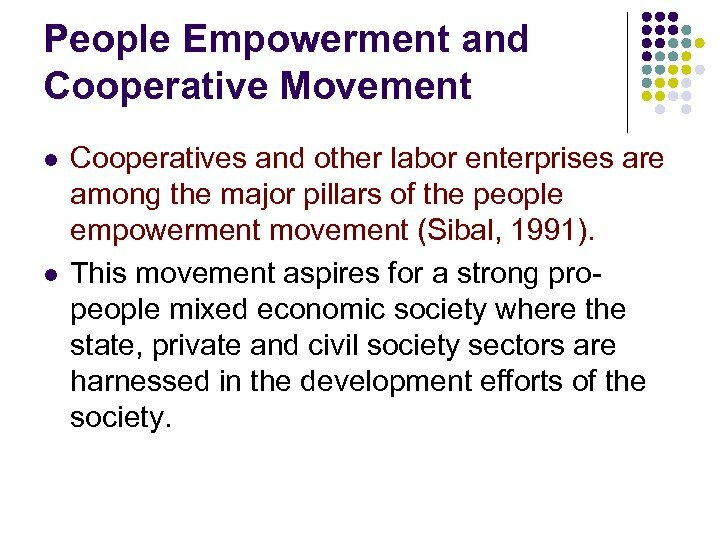 People Empowerment and Cooperative Movement l l Cooperatives and other labor enterprises are among the major pillars of the people empowerment movement (Sibal, 1991). This movement aspires for a strong propeople mixed economic society where the state, private and civil society sectors are harnessed in the development efforts of the society. 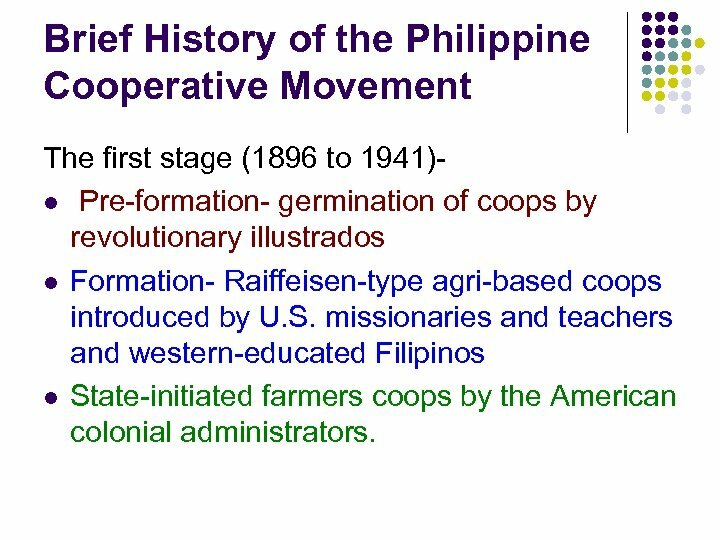 Brief History of the Philippine Cooperative Movement The first stage (1896 to 1941)l Pre-formation- germination of coops by revolutionary illustrados l Formation- Raiffeisen-type agri-based coops introduced by U. S. missionaries and teachers and western-educated Filipinos l State-initiated farmers coops by the American colonial administrators. 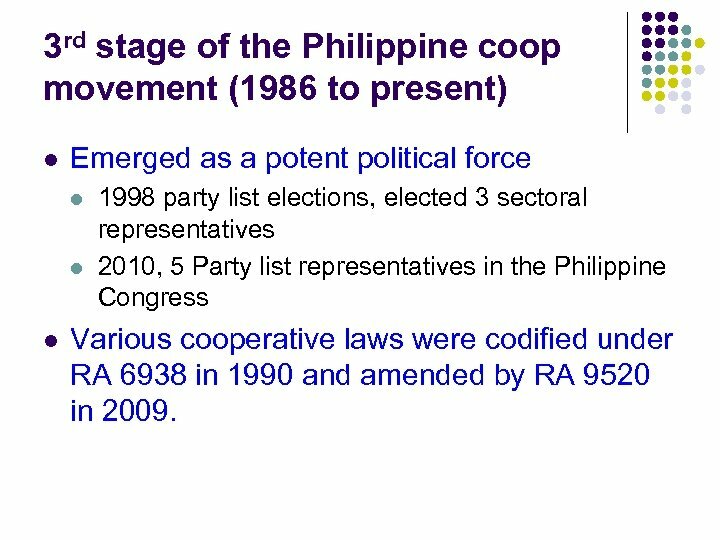 3 rd stage of the Philippine coop movement (1986 to present) l Emerged as a potent political force l l l 1998 party list elections, elected 3 sectoral representatives 2010, 5 Party list representatives in the Philippine Congress Various cooperative laws were codified under RA 6938 in 1990 and amended by RA 9520 in 2009. 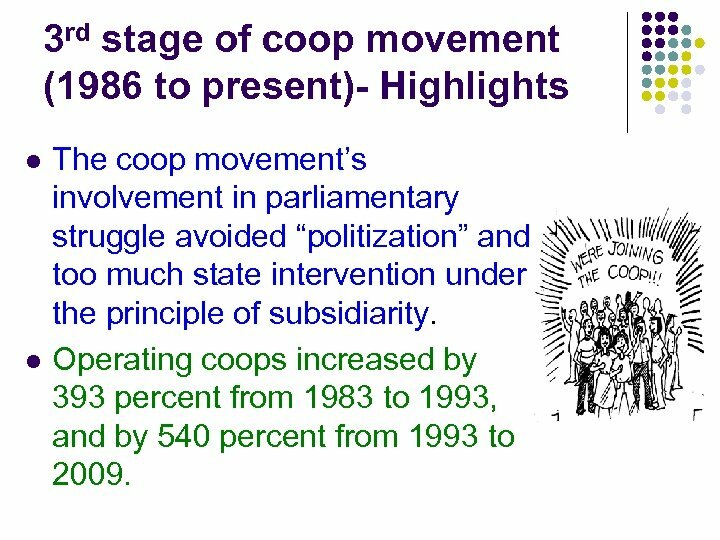 3 rd stage of coop movement (1986 to present)- Highlights l l The coop movement’s involvement in parliamentary struggle avoided “politization” and too much state intervention under the principle of subsidiarity. Operating coops increased by 393 percent from 1983 to 1993, and by 540 percent from 1993 to 2009. 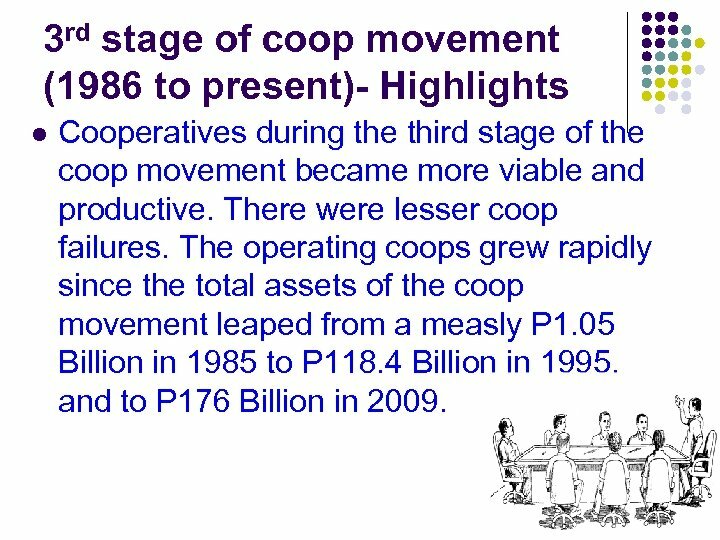 3 rd stage of coop movement (1986 to present)- Highlights l l The coops’ businesses shifted to higher value added multi-purpose coops and its total assets leaped from a measly P 1. 05 Billion in 1985 to P 176 Billion in 2009. The movement’s contribution to the country’s GDP has reached 5. 14 percent in 2007. Pres. Pnoy’s Path of Inclusive Growth l l l The focus of President PNoy Aquino’s Philippine Development Plan is an “inclusive growth” strategy. It means active participation of the citizenry in the country’s growth and a major beneficiary at the same time (ILO, 2010). It is focused in maximizing job creation in reducing poverty. Hence, the role of the cooperative sector is a vital component in this national endeavor. 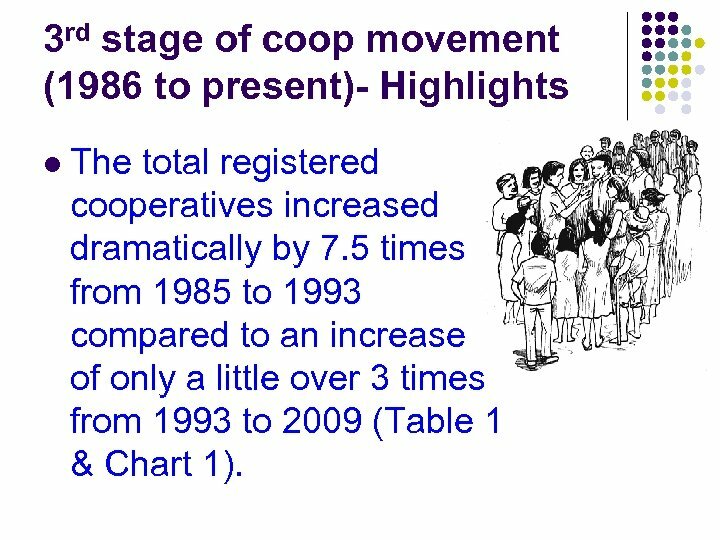 3 rd stage of coop movement (1986 to present)- Highlights l The total registered cooperatives increased dramatically by 7. 5 times from 1985 to 1993 compared to an increase of only a little over 3 times from 1993 to 2009 (Table 1 & Chart 1). 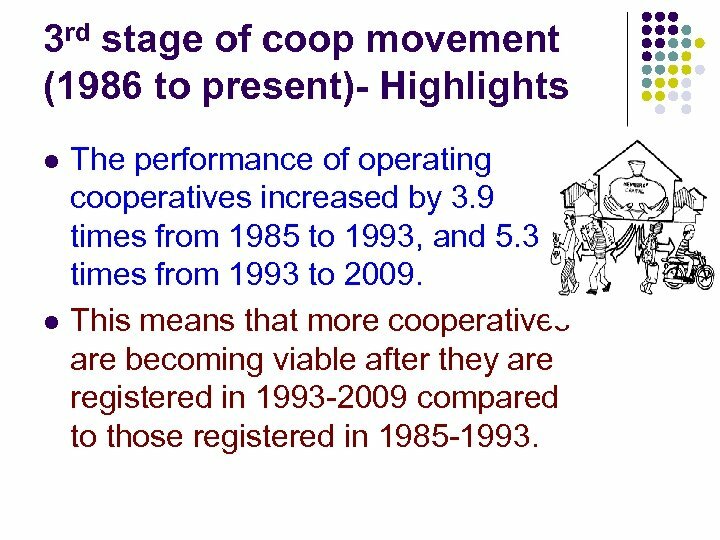 3 rd stage of coop movement (1986 to present)- Highlights l l The performance of operating cooperatives increased by 3. 9 times from 1985 to 1993, and 5. 3 times from 1993 to 2009. This means that more cooperatives are becoming viable after they are registered in 1993 -2009 compared to those registered in 1985 -1993. 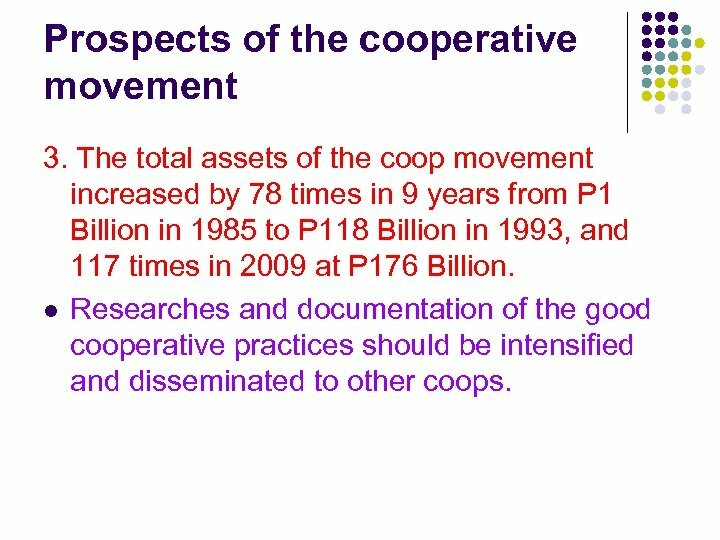 3 rd stage of coop movement (1986 to present)- Highlights l l The increases in the number of operating cooperatives were bigger in multipurpose cooperatives at 790 percent in 2009, followed by services at 448 percent, producers at 316 percent and marketing at 235 percent. Credit was steady at 157 percent in 2009 (Table 1). Cooperatives now engage in higher value processes compared to lower value processes involved in credit and consumer store operations. 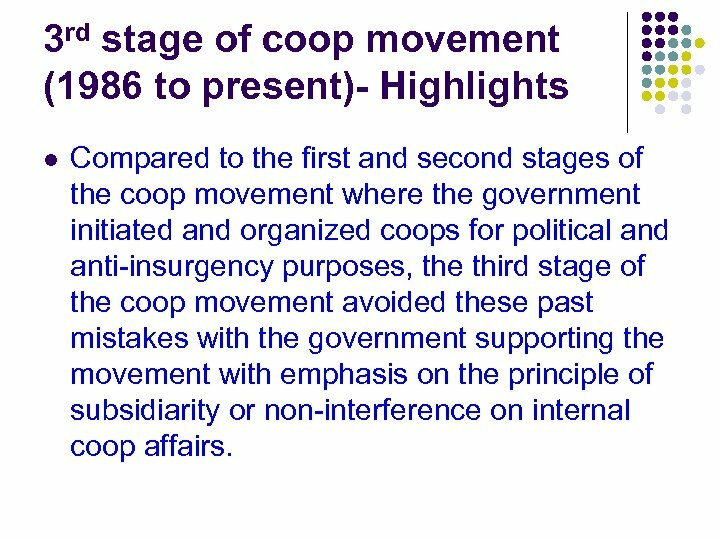 3 rd stage of coop movement (1986 to present)- Highlights l Compared to the first and second stages of the coop movement where the government initiated and organized coops for political and anti-insurgency purposes, the third stage of the coop movement avoided these past mistakes with the government supporting the movement with emphasis on the principle of subsidiarity or non-interference on internal coop affairs. 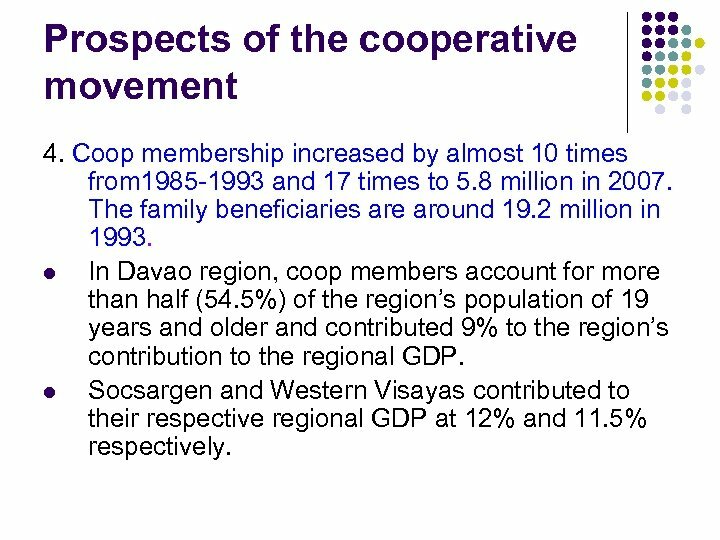 3 rd stage of coop movement (1986 to present)- Highlights l Cooperatives during the third stage of the coop movement became more viable and productive. There were lesser coop failures. 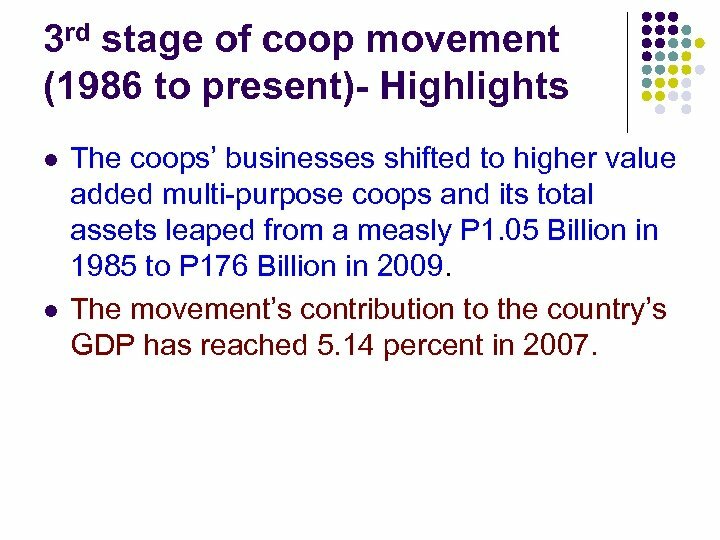 The operating coops grew rapidly since the total assets of the coop movement leaped from a measly P 1. 05 Billion in 1985 to P 118. 4 Billion in 1995, and to P 176 Billion in 2009. 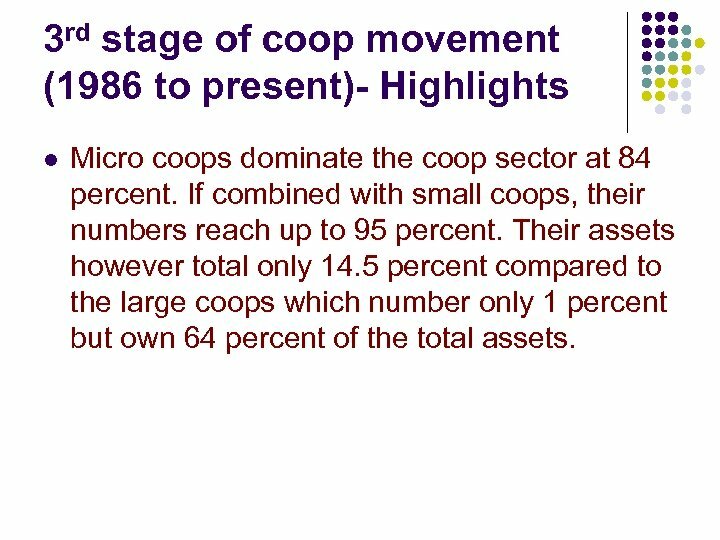 3 rd stage of coop movement (1986 to present)- Highlights l Micro coops dominate the coop sector at 84 percent. If combined with small coops, their numbers reach up to 95 percent. Their assets however total only 14. 5 percent compared to the large coops which number only 1 percent but own 64 percent of the total assets. 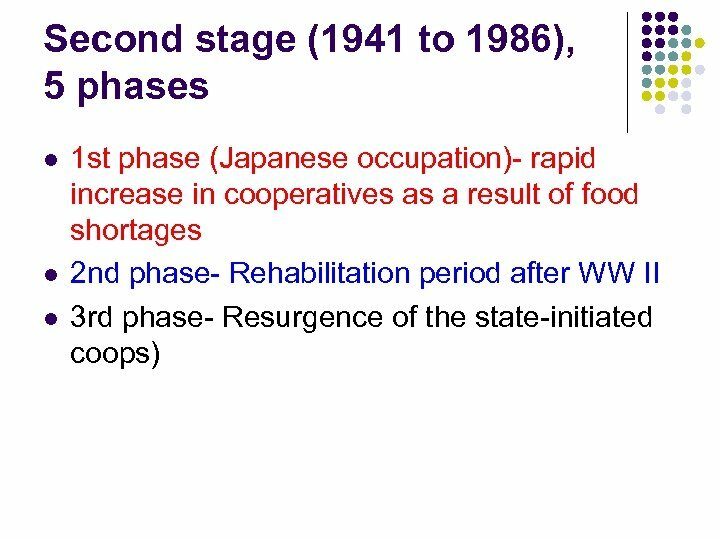 3 rd stage of coop movement (1986 to present)- Highlights l The good thing about this is that micro coops, even with small capitalization, are able to provide more jobs to the poor. Large coops, on the other hand are able to engage in higher value production processes as shown in Tables 3 and 4. 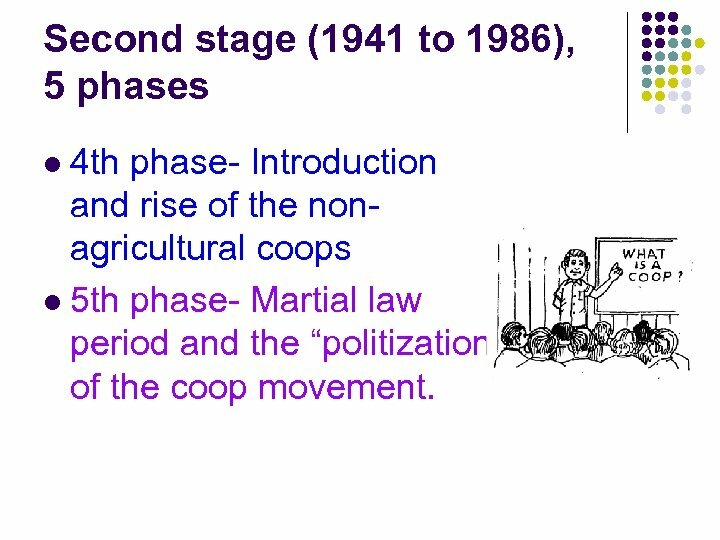 3 rd stage of coop movement (1986 to present)- Highlights l l l The concept of “big brother, small brother” cooperation among cooperatives is necessary. Federation and union work has now become very crucial in furthering the growth of the coop movement. 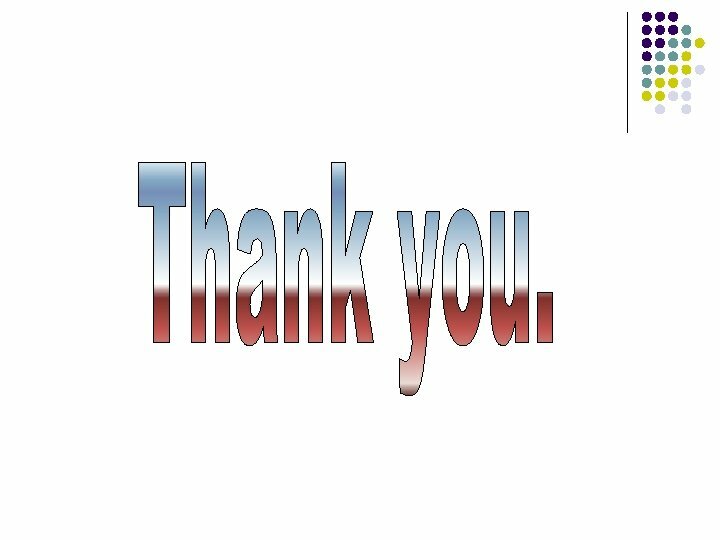 Big coop primaries and federations need to merge or consolidate like the NATCCOMASS-SPECC consolidation plan in 2012. 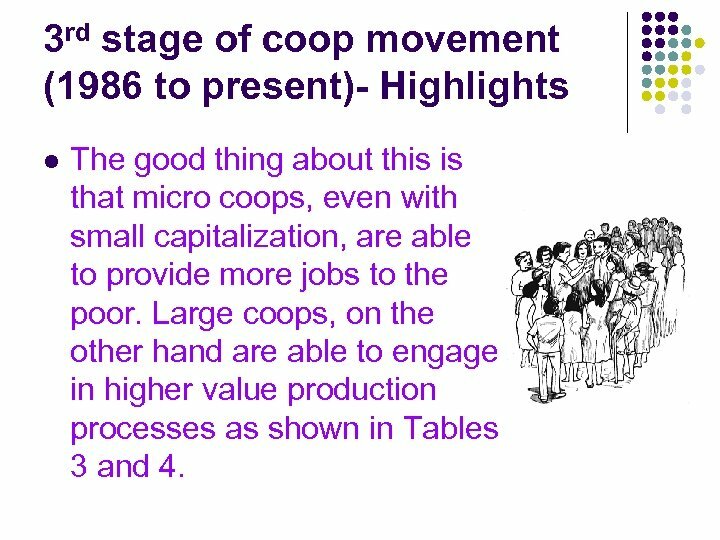 3 rd stage of coop movement (1986 to present)- Highlights l l The big coops, acting as big brothers, need to harness the capabilities of micro and small coops by technology transfers and joint cooperative business ventures like the MICOOP program of the NATCCO. Other new trends in coop business ventures include branding of coop products and services, franchising or networking arrangements, or even outsourcing. 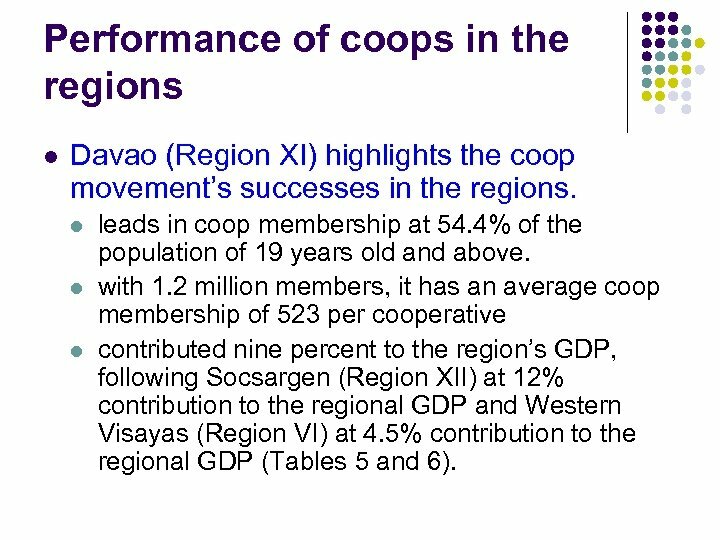 Performance of coops in the regions l Davao (Region XI) highlights the coop movement’s successes in the regions. l leads in coop membership at 54. 4% of the population of 19 years old and above. with 1. 2 million members, it has an average coop membership of 523 per cooperative contributed nine percent to the region’s GDP, following Socsargen (Region XII) at 12% contribution to the regional GDP and Western Visayas (Region VI) at 4. 5% contribution to the regional GDP (Tables 5 and 6). 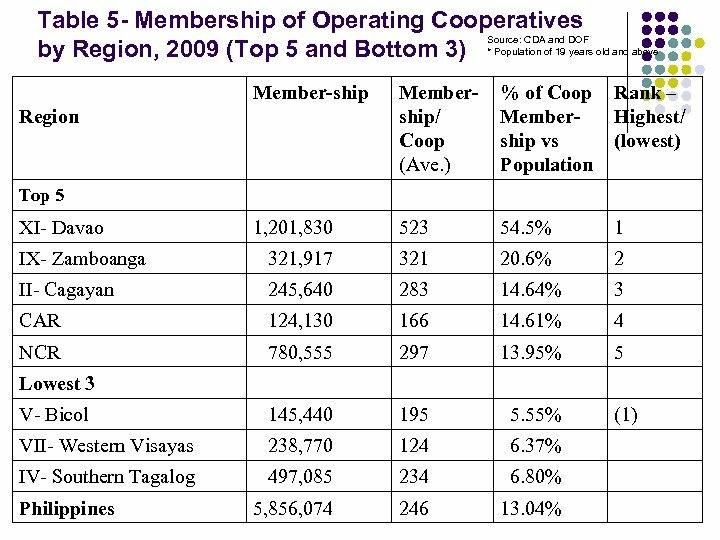 Performance of coops in the regions l l l Bicol (Region V) and Southern Tagalog (Region IV) are the least performers in coop membership and in regional contribution to GDP. Region IV is a fast growing region in manufacturing and services, hence coops cannot compare with the output of big manufacturing enterprises. Bicol region, being a depressed region in terms of manufacturing, needs more intense coop development to help empower the poor. Problems of the Coop Movement 1. Lack of education and training 2. Lack of capital 3. Inadequate volume of business 4. Lack of loyal membership support 5. Vested interest and graft and corruption among coop leaders 6. Weak leadership and mismanagement 7. 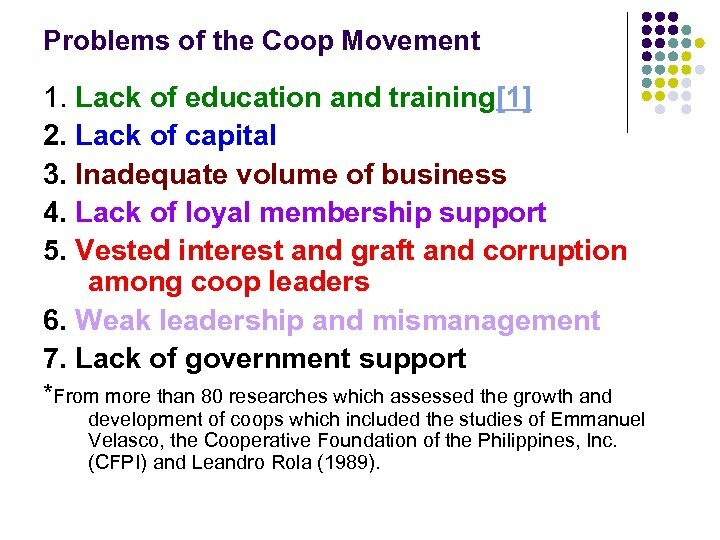 Lack of government support *From more than 80 researches which assessed the growth and development of coops which included the studies of Emmanuel Velasco, the Cooperative Foundation of the Philippines, Inc. (CFPI) and Leandro Rola (1989). 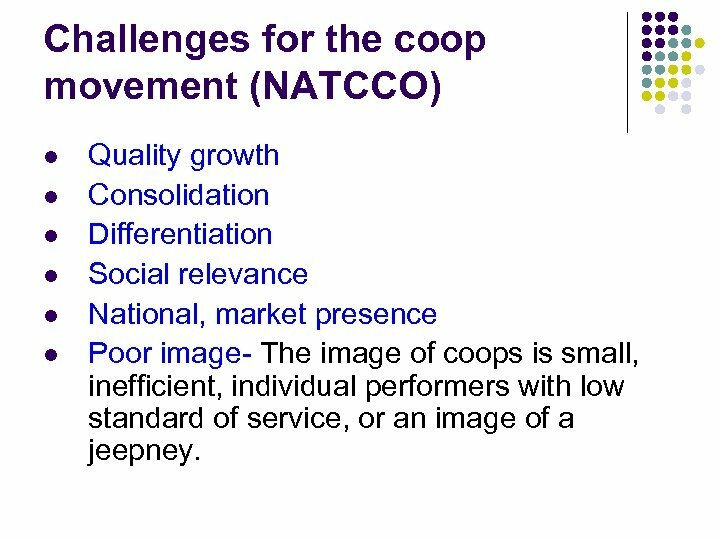 Challenges for the coop movement (NATCCO) l l l Quality growth Consolidation Differentiation Social relevance National, market presence Poor image- The image of coops is small, inefficient, individual performers with low standard of service, or an image of a jeepney. Problems of the cooperative movement A large number of cooperatives remain unviable. Only 23, 836 or 30 percent of the 78, 611 registered coops in 2009 are reporting/operating. 1. l There is a need to further strengthen coop education and training through the coop federations, councils and unions, NGO training centers, state colleges and universities, etc. 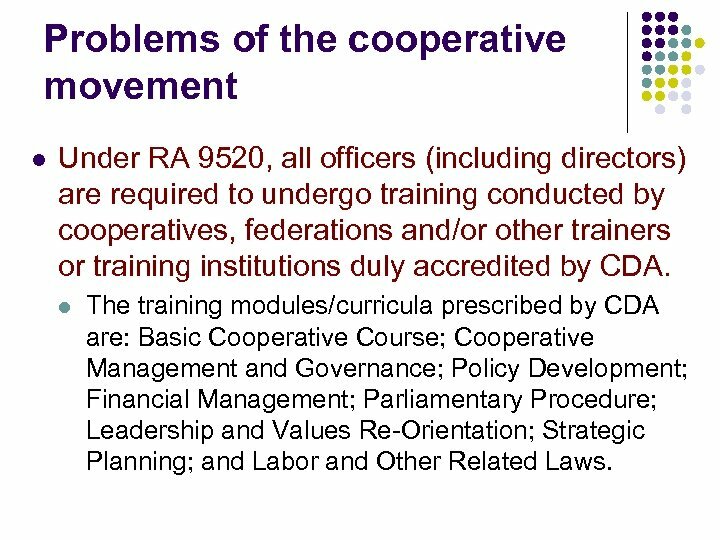 Problems of the cooperative movement l Under RA 9520, all officers (including directors) are required to undergo training conducted by cooperatives, federations and/or other trainers or training institutions duly accredited by CDA. l The training modules/curricula prescribed by CDA are: Basic Cooperative Course; Cooperative Management and Governance; Policy Development; Financial Management; Parliamentary Procedure; Leadership and Values Re-Orientation; Strategic Planning; and Labor and Other Related Laws. 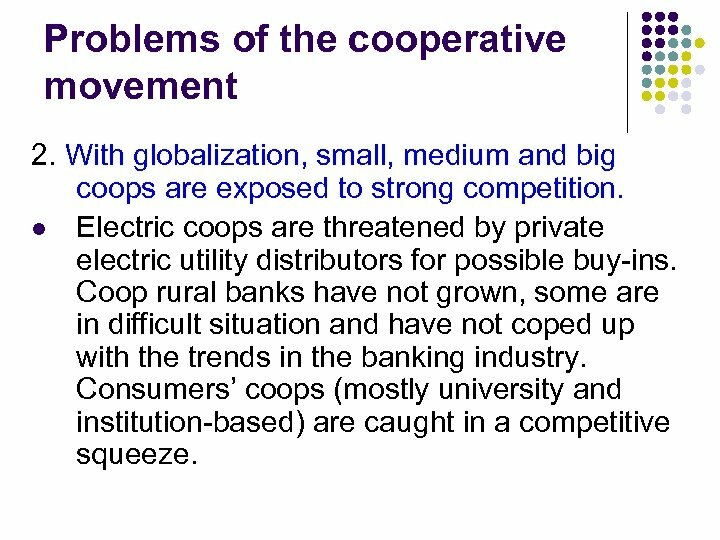 Problems of the cooperative movement 2. With globalization, small, medium and big coops are exposed to strong competition. l Electric coops are threatened by private electric utility distributors for possible buy-ins. Coop rural banks have not grown, some are in difficult situation and have not coped up with the trends in the banking industry. Consumers’ coops (mostly university and institution-based) are caught in a competitive squeeze. Problems of the cooperative movement 3. Unionization in some medium and big size coops continues. This implies that the coop management practices in some cooperatives are still very reactive and less participative. 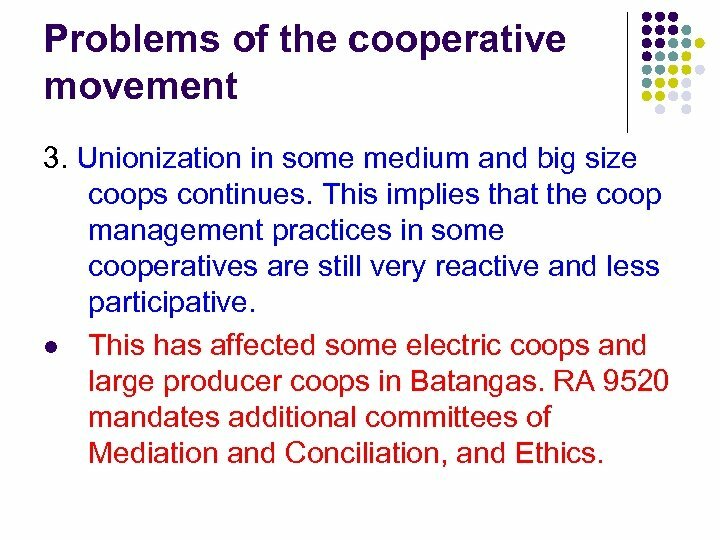 l This has affected some electric coops and large producer coops in Batangas. RA 9520 mandates additional committees of Mediation and Conciliation, and Ethics. Problems of the cooperative movement 4. Agri-based cooperatives like those in the agrarian reform communities and plantations are not showing improvement in productivity. l Some are mismanagement. 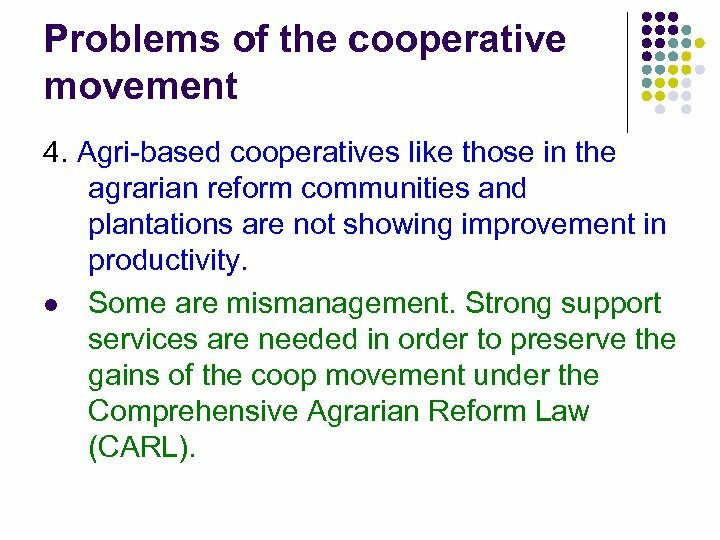 Strong support services are needed in order to preserve the gains of the coop movement under the Comprehensive Agrarian Reform Law (CARL). 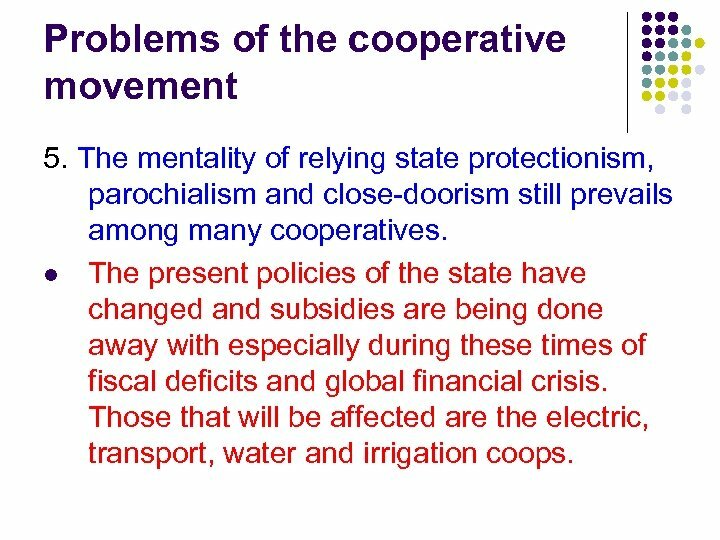 Problems of the cooperative movement 5. The mentality of relying state protectionism, parochialism and close-doorism still prevails among many cooperatives. l The present policies of the state have changed and subsidies are being done away with especially during these times of fiscal deficits and global financial crisis. Those that will be affected are the electric, transport, water and irrigation coops. 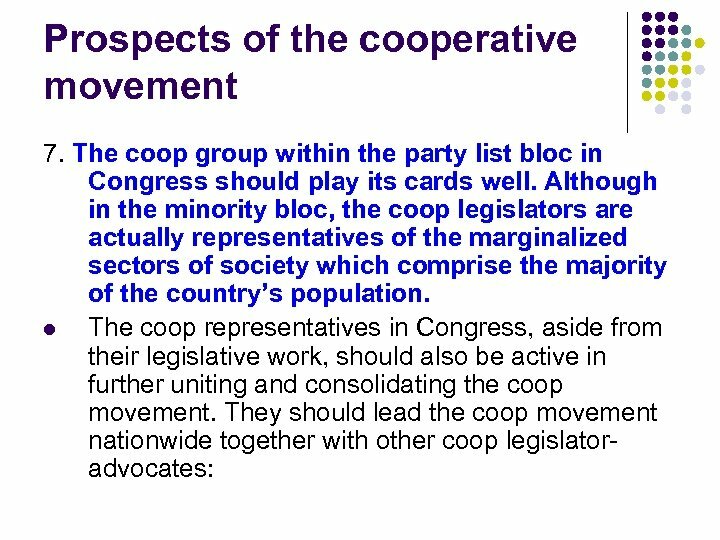 Prospects of the cooperative movement 1. President PNoy Aquino is cooperative friendly. 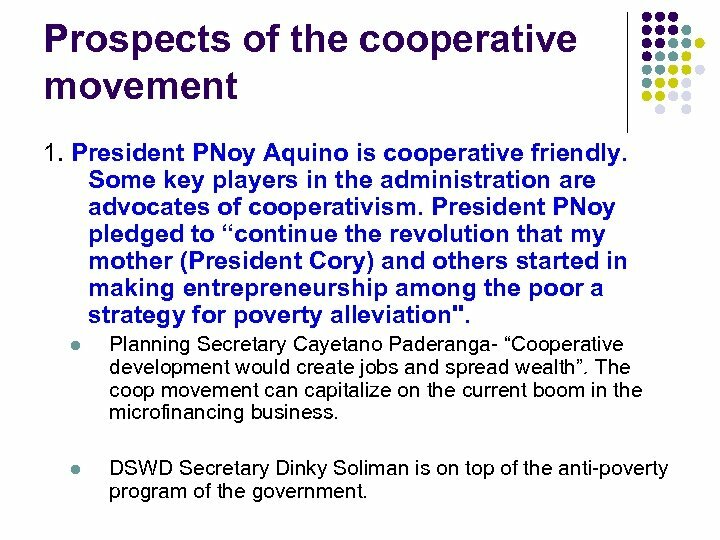 Some key players in the administration are advocates of cooperativism. President PNoy pledged to “continue the revolution that my mother (President Cory) and others started in making entrepreneurship among the poor a strategy for poverty alleviation". l Planning Secretary Cayetano Paderanga- “Cooperative development would create jobs and spread wealth”. The coop movement can capitalize on the current boom in the microfinancing business. l DSWD Secretary Dinky Soliman is on top of the anti-poverty program of the government. 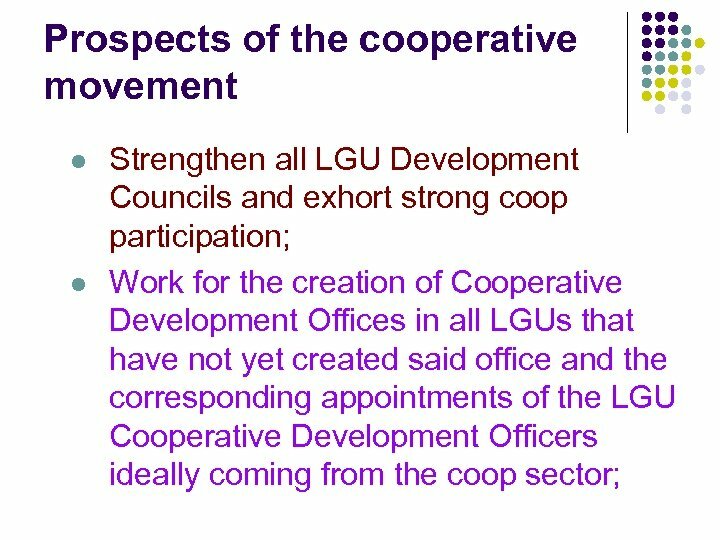 Prospects of the cooperative movement 2. 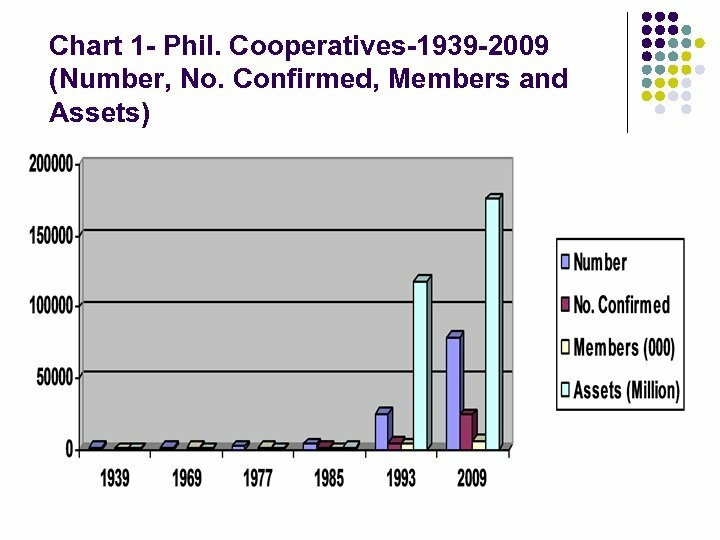 Operating coops increased 4 times from 1985 -1993 and 53 times from 1993 -2009. 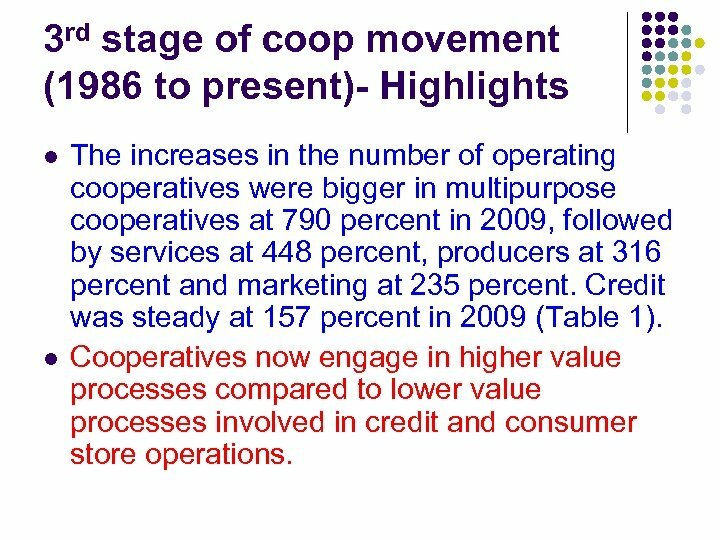 Coops engaged in high value operations increased higher than credit coops. l Multi-purpose coops increased by 8 folds, service coops by 4. 5 folds, and coop federation by 4 folds. 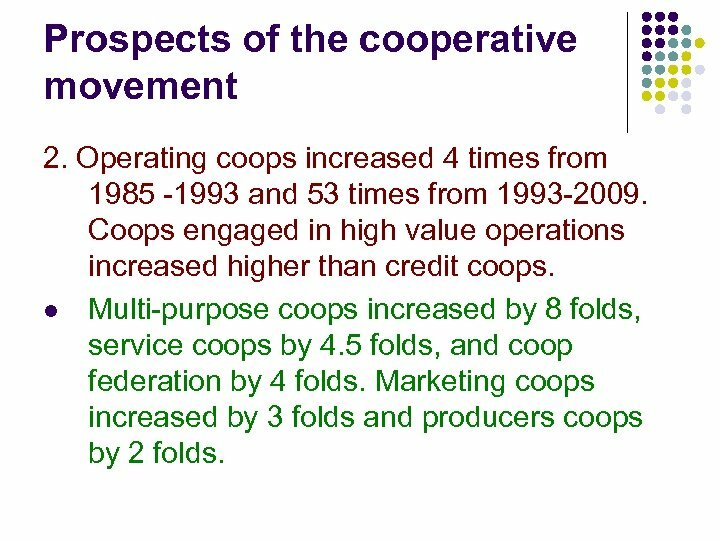 Marketing coops increased by 3 folds and producers coops by 2 folds. Prospects of the cooperative movement 3. 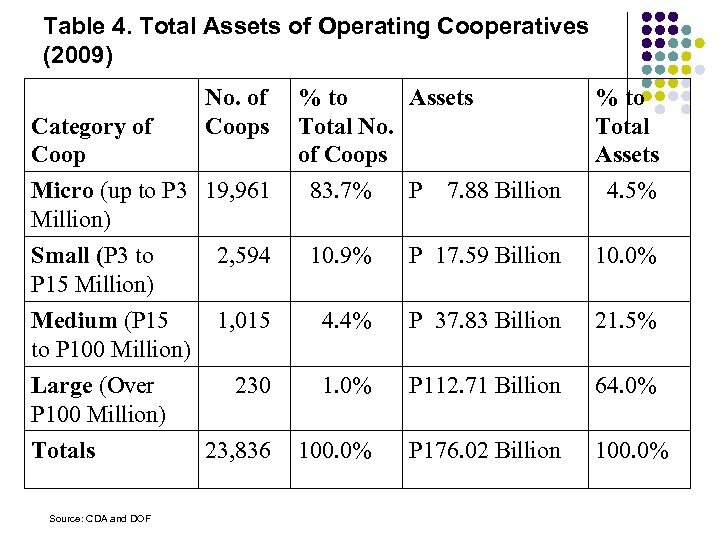 The total assets of the coop movement increased by 78 times in 9 years from P 1 Billion in 1985 to P 118 Billion in 1993, and 117 times in 2009 at P 176 Billion. 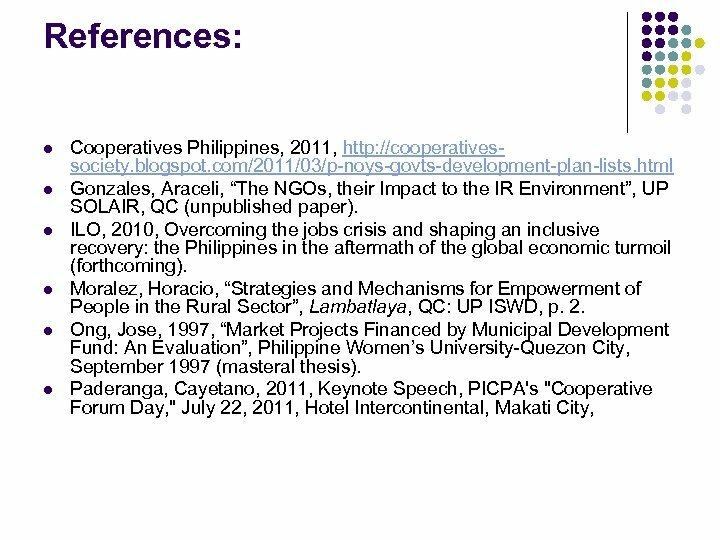 l Researches and documentation of the good cooperative practices should be intensified and disseminated to other coops. Prospects of the cooperative movement 4. Coop membership increased by almost 10 times from 1985 -1993 and 17 times to 5. 8 million in 2007. The family beneficiaries are around 19. 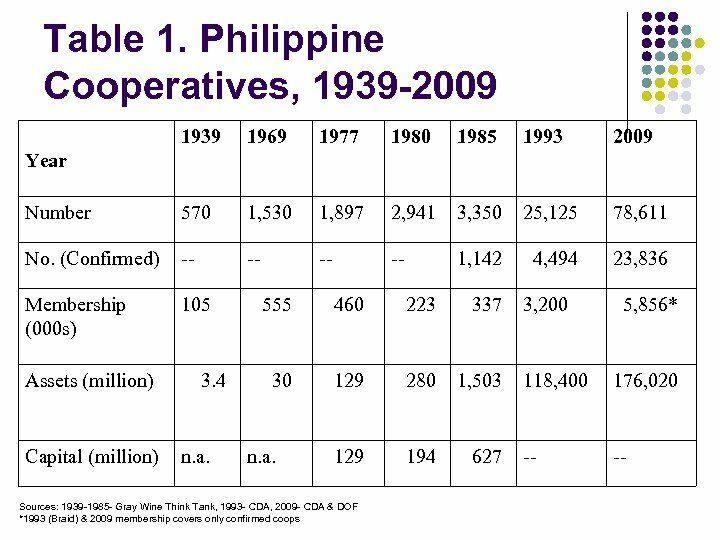 2 million in 1993. l In Davao region, coop members account for more than half (54. 5%) of the region’s population of 19 years and older and contributed 9% to the region’s contribution to the regional GDP. 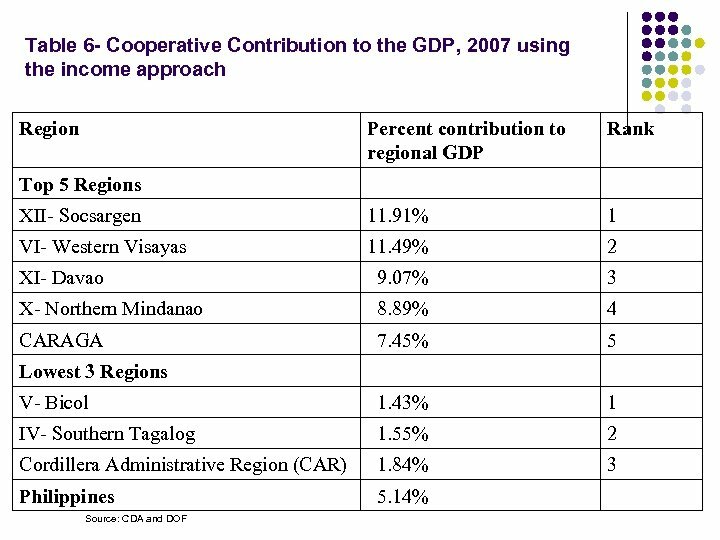 l Socsargen and Western Visayas contributed to their respective regional GDP at 12% and 11. 5% respectively. 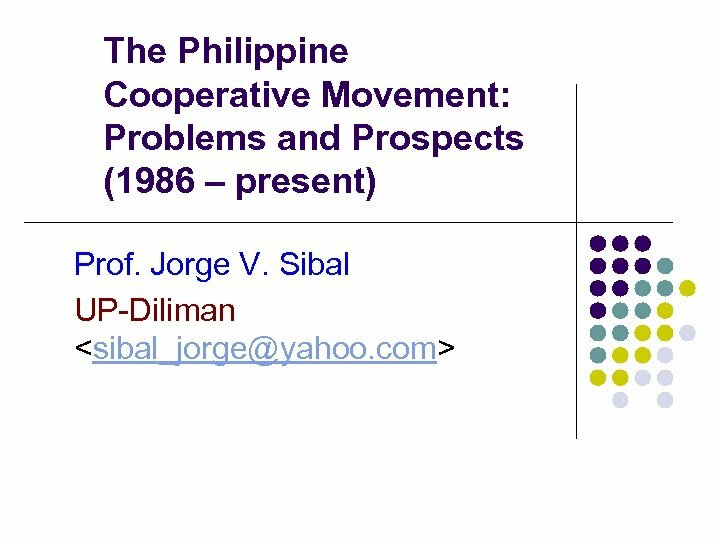 Prospects of the cooperative movement 6. “Big brother, small brother” cooperation among cooperatives will further the growth of the coop sector. This means more intensive Federation and union work and advocacy that will not compete but will strengthen the operations of the primary coops. l Big coop primaries and federations need to merge or consolidate like the NATCCO-MASS-SPECC consolidation plan in 2012. l The big coops should harness the capabilities of micro and small coops through technology transfers and joint business ventures like the MICOOP program of the NATCCO. 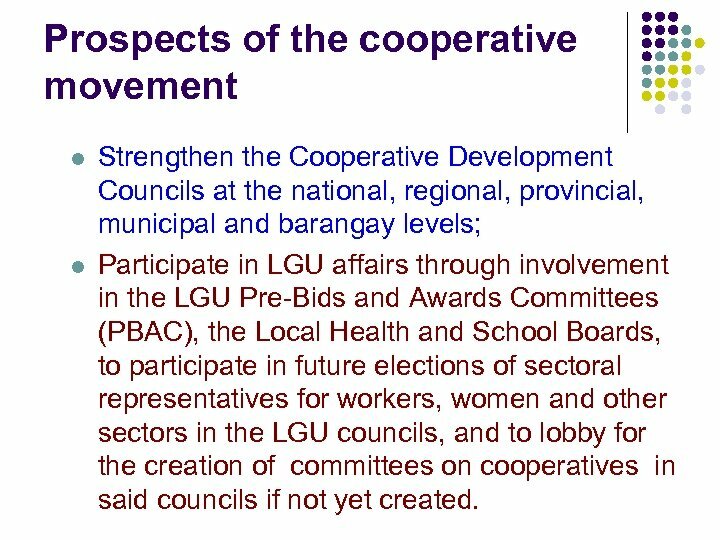 Prospects of the cooperative movement l l Strengthen the Cooperative Development Councils at the national, regional, provincial, municipal and barangay levels; Participate in LGU affairs through involvement in the LGU Pre-Bids and Awards Committees (PBAC), the Local Health and School Boards, to participate in future elections of sectoral representatives for workers, women and other sectors in the LGU councils, and to lobby for the creation of committees on cooperatives in said councils if not yet created. References: l l l Barce, Jo Anne, 1995, “The Effects of Education in Membership Participation in Cooperative Activities”, QC: UP SOLAIR (unpublished paper). 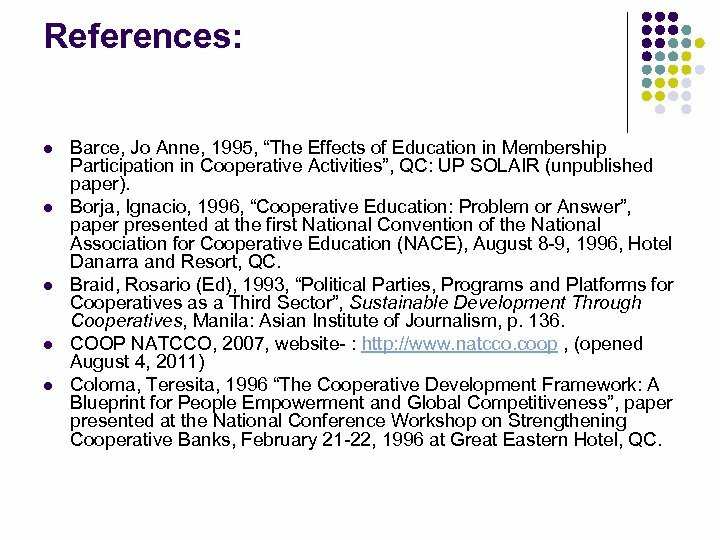 Borja, Ignacio, 1996, “Cooperative Education: Problem or Answer”, paper presented at the first National Convention of the National Association for Cooperative Education (NACE), August 8 -9, 1996, Hotel Danarra and Resort, QC. 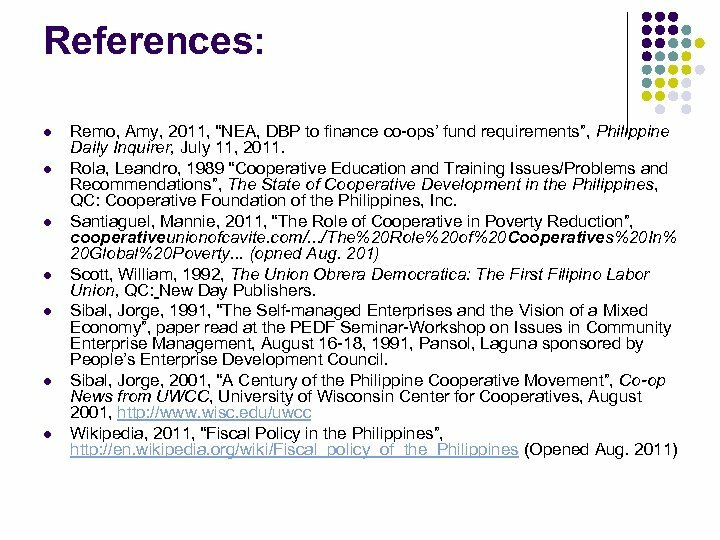 Braid, Rosario (Ed), 1993, “Political Parties, Programs and Platforms for Cooperatives as a Third Sector”, Sustainable Development Through Cooperatives, Manila: Asian Institute of Journalism, p. 136. COOP NATCCO, 2007, website- : http: //www. natcco. coop , (opened August 4, 2011) Coloma, Teresita, 1996 “The Cooperative Development Framework: A Blueprint for People Empowerment and Global Competitiveness”, paper presented at the National Conference Workshop on Strengthening Cooperative Banks, February 21 -22, 1996 at Great Eastern Hotel, QC.